Preheat oven to 400˚. Cube sweet potato and onion. Toss with 1/2 tablespoon olive oil and rosemary. Roast until tender, 20-25 minutes. Rinse quinoa and combine with water in a sauce pan. Bring to a boil, reduce to low heat, cover, and let cook for 15 minutes. Remove from heat and let sit for another 5 minutes, still covered. Let sweet potatoes and quinoa cool while making soft-boiled eggs. Bring a pot of water to a boil and reduce to a fast simmer. Add eggs and let cook for 5-7 minutes (5 minutes for runny yolks, 7 minutes for slightly firmer yolk). Remove and place in an ice bath for 60 seconds. 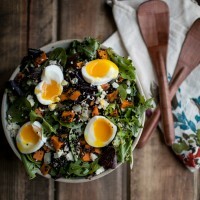 In a large bowl combine lettuce, sweet potatoes, quinoa, sunflower seeds, and gorgonzola. Drizzle olive oil and balsamic vinegar over salad and toss together. Top salad with eggs.